Make one giant pot pie instead of individual pies. You can pour the entire beef stew mixture into a 9x13 baking dish. You only need one box of puff pastry--slightly overlap the edges of two side-by-side pastry sheets and press the seam with your fingers to seal them together. Place the pastry sheet on top of the baking dish, trim the edges, brush with egg wash, and bake as described above. Easy! CUT PASTRY TOPS: Use 12-16 oz. oven proof bowls. Turn one upside down on thawed pastry sheet and cut around it with a small knife. Repeat for number of crusts you need. Cut small cookie cutter shapes out of leftover dough, if desired. Cover cut pastry rounds with plastic wrap and refrigerate until needed. MAKE THE STEW: Heat 1 tablespoon olive oil in Dutch oven over med-high heat. Pat meat dry, sprinkle with salt and pepper, add half to pan. Cook, stir occasionally, until browned and liquid gone. Remove to plate and repeat with remaining meat. Remove to plate. Add 1 tablespoon olive oil to pan, add mushrooms; cook until liquid is gone. Stir in tomato paste, garlic, thyme, and rosemary; cook for approx 30 seconds. Stir in dry sherry, scraping up any browned bits. Stir in the broth, potatoes, and browned meat. Bring to boil, reduce to simmer, cover and cook until potatoes are cooked and beef is tender, approx. 30-45 min. Add onions. Whisk together cornstarch and cold water, stir into soup and cook until thickened; approx. 2 minutes. Remove from heat; stir in parsley and frozen peas & carrots. Season with salt to taste. 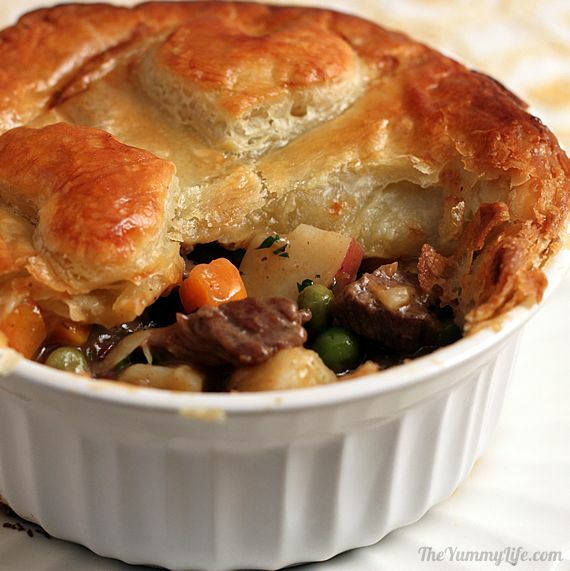 ASSEMBLE THE POT PIES: Ladle stew into ovenproof bowls, place puff pastry round on top. Gently stretch and press pastry edges over lip of bowl. Make egg wash by whisking egg with 1 tablespoon water, brush on pastry tops. Add pastry cookie cutter shapes on top of pastry rounds (if using) and brush those with egg wash. Place bowls on foil lined baking sheet for easy clean up and easy of handling. BAKING INSTRUCTIONS: Bake at 400 until crusts are golden and filling is bubbly. --To bake right away, bake for 25-35 minutes. --To bake if refrigerated, bake 40-50 minutes. --To bake if frozen, bake 1 to 1-1/4 hours. If crust browns before filling is bubbly, place a loose piece of foil across the top to prevent over browning. Let pies rest 15-20 minutes before serving to allow filling to cool and thicken. MAKE ONE GIANT PIE INSTEAD OF INDIVIDUAL PIES: Pour the entire beef stew mixture into a 9x13 baking dish. You only need one box of puff pastry--slightly overlap the edges of two side-by-side pastry sheets and press the seam with your fingers to seal them together. Place the pastry sheet on top of the baking dish, trim the edges, brush with egg wash, add decorate cookie-cutter pastry shapes and brush them with egg wash, and bake as described above. 0 Response to "Individual Puff Pastry Beef Pot Pies"